Trellis-back chair, one of a group including XF117 - XF120, XF149, XF150, XF215 & XF216, by John Robins (1776-1828), 1821, mahogany and leather. ©Sir John Soane's Museum, London. Photograph: Hugh Kelly. Over-upholstered in dark red leather; rectangular reeded top rails; turned and moulded columnar back uprights with triple bead moulding around the tops, rectangular ebonised panels top and bottom and paterae on top of the top rail at each end; the backs with inset reeded frames enclosing a diagonal (elongated diamond) trellis with moulded paterae at its intersections; sabre back legs and turned moulded front legs on plain turned feet with leather upholstery. One of a set of eight with XF117, XF118, XF119, XF120, XF149, XF150, and XF215. John Robins invoiced Soane on 30 August 1821 for ‘8 Mahogany trellis back chairs moulded & Paneled [sic] seats French stuffed covered with black Spanish Morocco red welts [and] stout turned feet to pattern £25.4s’.1 The bill highlights the sophisticated colour scheme of the upholstery in the Library and Dining Room in the early 1820s with the chairs upholstered in black leather with red trim, which would have matched the black horsehair upholstery on the couch (XF106). At the time of Soane’s death in 1837 the two armchairs and four of the chairs were in the Dining Room. Chair XF215 is inscribed in ink on one strut ‘Back Parlour’ (i.e. Dining Room). The other four chairs were in the Breakfast Room. 1 R.A. Woods (ed. ), English Furniture at the Bank of England, 1972, figure 18. 2 SM Archive Bank Bill Book no. 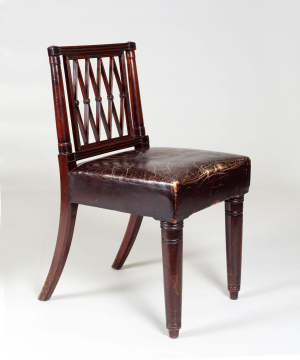 9: the chairs for the Bank (‘mahogany trellis chairs, the back legs reeded and fluted, the seats covered with best leather’) cost 84s each. 3 Description, 11th edition, 1930, p. 32.